If you’re a music freak like me, this is the area to be for music collectors and vinyl lovers. On St Eriksgatan only are already about 5 shops to get your fix. Not to mention other streets like Odengatan nearby where is even more gems to find. I will start at the beginning of the street, close to where I live. 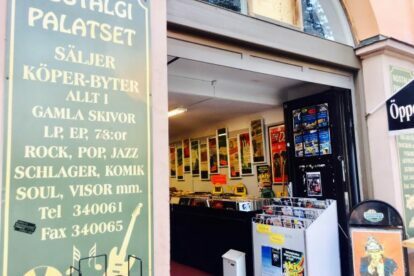 Nostalgipalatset (see image), doesn’t have only 2nd hand vinyl but also has 2nd hand toys, like collector’s items Star Wars figures, books, magazines and posters & adverts available. You can literally get lost in time here and it’s one of my favourites since they have a pretty good turnover on buying and selling. Here you will find a lot more rock and 70’s/ 80’s orientated music like The Stones, ABBA, Zappa, Genesis etc. If you want to check out in advance if something might be available, Record Hunter might be the place for you. They have an online registry on discogs.com and this way you won’t get disappointed. What you see is what you get and this shop is a bit more focused on Motown and Jazz. Overall, I could go on forever giving hints and descriptions, but I think it’s better to do some ‘crate diggin’ yourself since you can spend a whole day around there – just check the opening hours on the websites. Happy hunting!